The night kicked off with Martin Harley, a singer/songwriter who performs solo. He sits and plays a lap guitar while singing. He’s supported beth Hart in the past, and listening to his set tonight, it’s clear why she’s invited him back to play on some of the dates on her current tour. 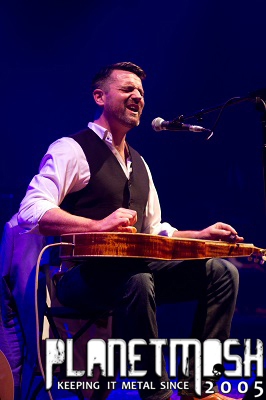 He’s got a very good voice and his guitar playing is excellent – a great performer. I enjoyed his whole set, with “Blues in my window” in particular being very impressive. He ended the set with “nobody’s fault but mine”. A great opening act. Beth Hart came out to huge applause and took her seat at the keyboard at the front of the stage where she performed the first song solo. After that she brought the band out and introduced them. From then on she performed some songs just singing and others seated and playing the keyboards as well as singing. Beth has an amazing talent – she is certainly one of the best female singers around with a powerful voice that carries so much emotion, and she pairs that with the ability to write amazing songs. When I say it’s a powerful voice I’m not kidding – it’s powerful normally but when she lets out a scream then she barely needs the microphone for the entire crowd to hear it. Between songs she talks to the audience and tells them stuff about the songs and what inspired her to write them. She comes across as slightly nervous but more excited and clearly enjoying every second of it, and her enthusiasm is infectious. Her band are probably often overlooked as all attention is on Beth most of the time, but they’re great musicians and the guitar solos in particular are greeted with plenty of applause. Beth doesn’t just stand and sing – she dances, jumps up and down excitedly, and moves around the stage – she seems to have far too much energy to stand still and would rather dance and have fun anyway. Unlike many artists she doesn’t stick to the same set each night of a tour and instead changes it for each show – one of the songs tonight (LA story) was apparently only added after it was requested at the meet and greet before the show. That lack of predictability is refreshing, and means that fans who go to more than one date on a tour don’t get the same show each night – every show is different. With so many great songs she’d never be able to play everything that fans want to hear, but I doubt if any go away disappointed even if she doesnt play their favourite song. While she has the band performing with her most of the time, for some songs such as the opening number and LA story, she performs solo. The solo songs have a more intimate feel to them than the band ones, but both types sound fantastic. 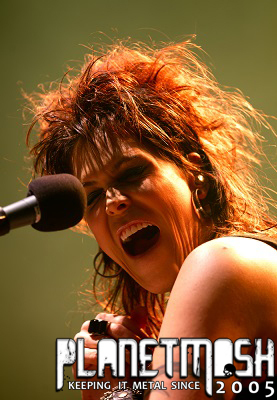 Beth Hart is a superb singer, and one that I’d recommend any blues lover go and see.